Your Friday link's are probably not dry..
Good news? 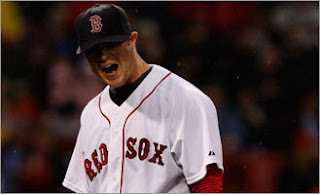 Jon Lester threw a complete game. The bad news? He lost the rain-shortened affair 2-1. The Sea Dogs welcomed Kason Gabbard back to Hadlock, but the Erie SeaWolves and Mother Nature were not quite as welcoming. The Boston Bruins won plenty of awards last night. Sadly, the Stanley Cup was not one of them. Don't expect to see the sun this weekend.